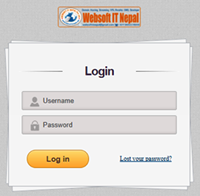 Ajay kumar mahto - Websoft IT Nepal Pvt. Ltd.
Hi This is me Ajay kumar mahto from Sanamati Majhaura Morang koshi nepal. I have studied web page designing and development from Websoft IT Nepal Pvt. Ltd. My Registration no is 160857/64. my contact mobile no. is 9802746250. My parent's name is Shambhu Mahto.I was completed Diploma in computer Engineering while joining here. Thank You.